Established in 2012, The Unit of Play (UoP) is a transdisciplinary unit, based in the Department of Sociology at Goldsmiths, University of London. Its main activities are co-ordinating and developing a research focus within the Department through the hosting of conferences, reading groups, research projects, salons, seminars, workshops as well as supporting doctoral research. The research focus is oriented around the collaborative exploration and incubation of radically new ideas, practices, and proposals that cut across established disciplinary, theoretical, methodological, and thematic boundaries and concerns of the social sciences, arts and humanities. The event is free, but registration is required due to limited capacity. To register, please go here. A small number of BURSARIES for unfunded PhD students/ECRs are available. Deadline for applications is APRIL 30. For further details on the eligibility criteria and the application process please go here. This symposium is the first of the After Progress symposium series. Together with fours guest speakers, we will begin to explore collectively how to understand our present as populated by the ruins of the modern idea of progress, and we’ll explore key questions concerning how we might cultivate plural arts of living and flourishing in the ruins. Andrea Bardin is Lecturer in Politics in the Department of Social Sciences at Oxford Brookes University, where he teaches political theory and philosophy. He is the author of Epistemology and political philosophy in Gilbert Simondon: individuation, technics, social systems (Springer 2015). Didier Debaise is a permanent researcher at the Fonds de la Recherche Scientifique (FNRS), and director of the Research Center in Philosophy at the Université Libre de Bruxelles (ULB). He is the author of Speculative Empiricism: Revisiting Whitehead (Edinburgh UP, 2017 ) and Nature as Event (Duke UP, 2017). Sanjay Seth is Professor of Politics in the Department of Politics and International Relations and co-director of the Centre for Postcolonial Studies at Goldsmiths, University of London. He is the author of Subject Lessons: The Western Education of Colonial India (Duke UP, 2007), Marxist Theory and Nationalist Politics: The Case of Colonial India (Sage, 1995), and editor of Postcolonial Theory and International Relations: A Critical Introduction (Routledge, 2012). 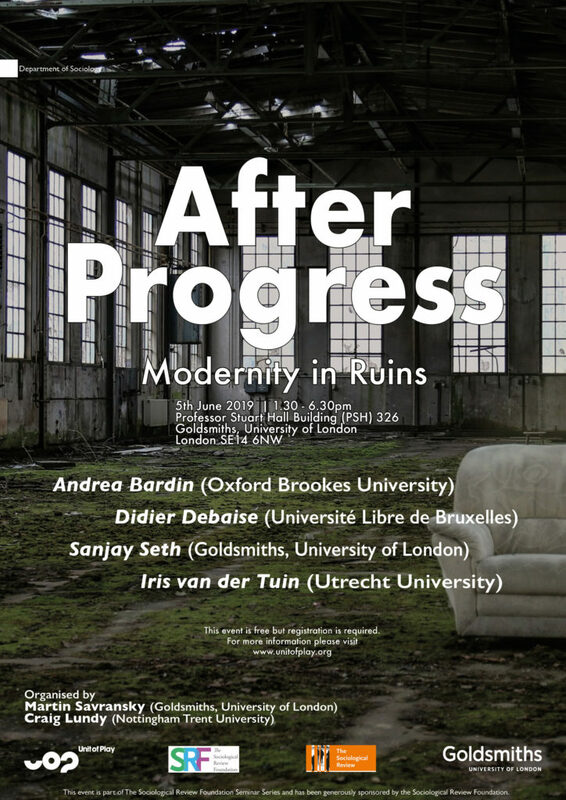 The After Progress symposium series co-organised by Dr Martin Savransky (Goldsmiths, University of London) and Dr Craig Lundy (Nottingham Trent University). It is part of the Sociological Review Seminar Series and it is generously funded by The Sociological Review Foundation. In this forthcoming symposium series, we propose to experiment, from an interdisciplinary and global perspective, with a pressing question for our troubled times: can we reimagine human and more-than-human arts of living and flourishing from the ruins of the modern idea of progress? The notion of “progress” is arguably the defining idea of modernity: a civilisational imagery of a boundless, linear, and upwards trajectory towards a future that, guided by reason and technology, will be “better” than the present. It was this notion that placed techno-science at the heart of the modern political culture, and it was the global unevenness of “progress” that imagined European imperialism as a civilising mission inflicted upon “backward” others for their own sake. Thanks to the relentless work carried out by decolonisation movements, as well as by scholars and intellectuals across the social sciences and humanities, the modern idea of progress and its deleterious consequences on a global scale have deservingly been the object of fierce criticism throughout the second half of the twentieth century. Denouncing its Eurocentric colonialism, its impoverished historicism, its rationalistic hubris, and its ecocidal extractivism, such criticisms decried the implications of the modern idea of “progress”, but they did not stop it from commanding global political imaginations, discourse, and policy to this day. Thus, rather than simply rehearsing such critiques, we propose a collective, speculative experimentation on plural arts of living and flourishing with others in the ruins of “progress”. For even at this time of socioecological devastation and perilous political repatternings, there are practical and conceptual propositions, emerging from a range of locations and experiences, that proffer generative contributions to the questions of how we might understand and effect change, learn to live and die well with others, and make other worlds possible, if we no longer rely on the modern coordinates of progress as our compass. Bringing 4 excellent guest speakers to discuss these and related questions on each session, these half-day symposia will take place at Goldsmiths, University of London, on 5th June, 12th September, and 29th November 2019. All welcome! Details on timetable, registration (required), and some bursaries for unfunded PhD students/ECRs, will be announced very soon. Watch this space! 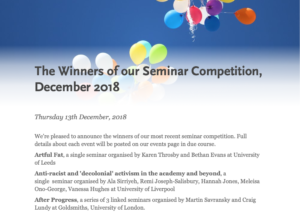 This symposium series co-organised by Dr Martin Savransky (Goldsmiths, University of London) and Dr Craig Lundy (Nottingham Trent University), it is part of the Sociological Review Seminar Series and it is generously funded by The Sociological Review Foundation. Since Darwin, we know that every biological identity is the result of a metamorphosis: every species is only a transformation of the one that preceded it. Based on some of the most remarkable examples (such as the transformation of the caterpillar into a butterfly), this talk would like to question the structure of life in its most extreme power: that of metamorphosis. In it is shown the fact that all life is unassignable to a specific anatomical and ecological identity and that all living beings participate in a single and unique life that crosses all forms and species. We will articulate the analysis of the forms of metamorphosis in three stages: mutation, nutrition and sexuality. 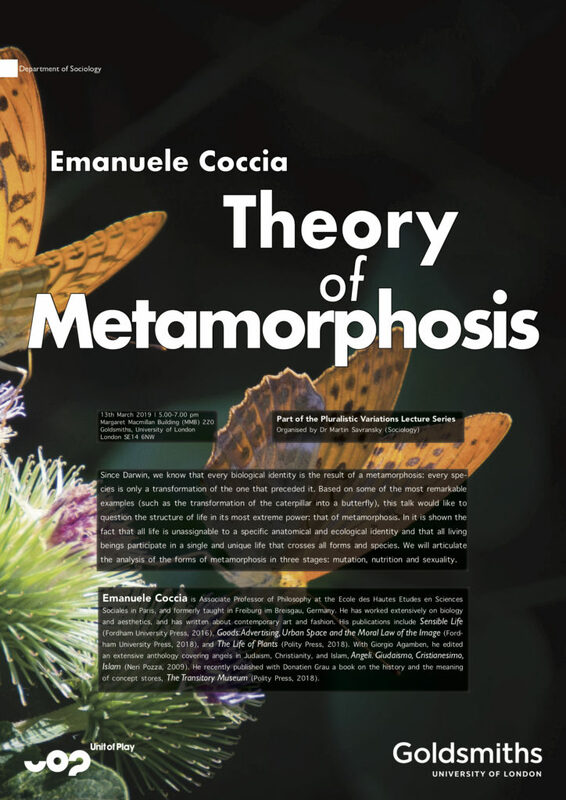 Emanuele Coccia is Associate Professor of Philosophy at the Ecole des Hautes Etudes en Sciences Sociales in Paris, and formerly taught in Freiburg im Breisgau, Germany. He has worked extensively on biology and aesthetics, and has written about contemporary art and fashion. His publications include Sensible Life (Fordham University Press, 2016), Goods:Advertising, Urban Space and the Moral Law of the Image (Ford- ham University Press, 2018), and The Life of Plants (Polity Press, 2018). With Giorgio Agamben, he edited an extensive anthology covering angels in Judaism, Christianity, and Islam, Angeli. Giudaismo, Cristianesimo, Islam (Neri Pozza, 2009). He recently published with Donatien Grau a book on the history and the meaning of concept stores, The Transitory Museum (Polity Press, 2018). This talk presents brief episodes of a history of the cosmos. Its immediate prompt is an exhibit planned by Bruno Latour at the Center for Arts and Media (ZKM) in Karlsruhe, Germany, called “Critical Zones.” Geoscientists apply this term to the space that sets the conditions of possibility for life as we know it— a few hundred feet below and above the surface of the earth. The impact of pollution and climate change on the complicated relations within the Critical Zone among soil, geology, meteorology, and biology, as well as the commitments and policies driving industry and land use, call out for new orientations—aesthetic, political, epistemological— toward the cosmos. My contribution to the exhibit is to plan a Hall of Cosmograms— representations of the universe– highlighting the interplay between “naturalist” approaches to the earth and alternatives, pointing out some of the conflicts and constraints involved in mobilizing representations of the universe. It’s a question of how to do things with worlds. This talk shows some possibilities. 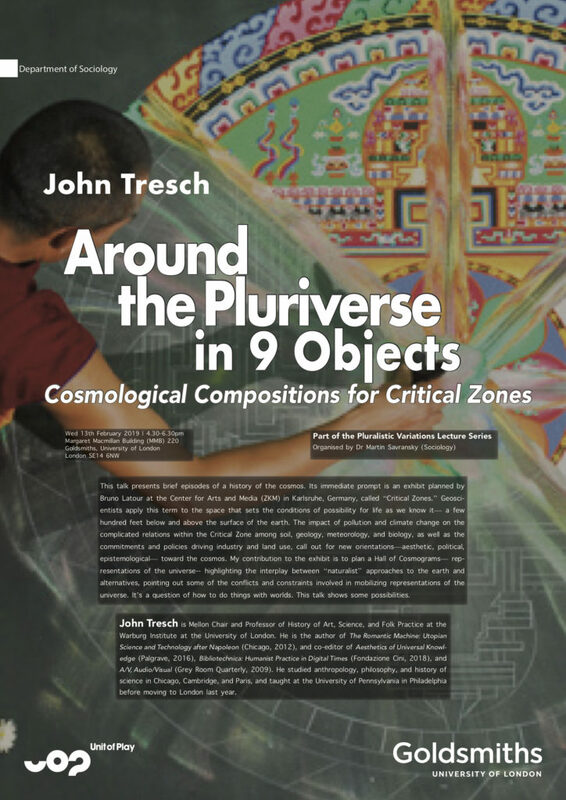 John Tresch is Mellon Chair and Professor of History of Art, Science, and Folk Practice at the Warburg Institute at the University of London. He is the author of The Romantic Machine: Utopian Science and Technology after Napoleon (Chicago, 2012), and co-editor of Aesthetics of Universal Knowledge (Palgrave, 2016), Bibliotechnica: Humanist Practice in Digital Times (Fondazione Cini, 2018), and A/V, Audio/Visual (Grey Room Quarterly, 2009). He studied anthropology, philosophy, and history of science in Chicago, Cambridge, and Paris, and taught at the University of Pennsylvania in Philadelphia before moving to London last year. Exciting news! 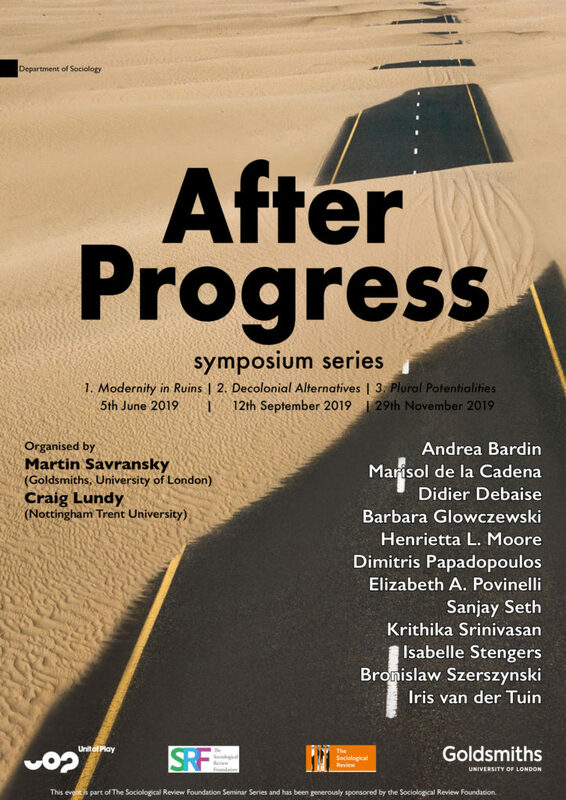 Martin Savransky (UoP director) and Craig Lundy (Nottingham Trent University) have secured some funds from the The Sociological Review for a series of symposia under the title of AFTER PROGRESS! More details, dates and line-up coming soon! Practices of truth play an important role in every day life and in many legal and political contexts. In 1987 the Parliamentary Assembly of the Council of Europe and the United Nations declared a “right to truth” as a human right against the background of the truth-commissions that had been established in South Africa and in South America. This development in the United Nations manifested an opposite trend to the one that took place in philosophy at the same time. But reflections about the search for truth in politics, the sciences and in philosophy are three very different things. It is a generally accepted insight of modern epistemology that absolute truth and absolute certainty are not possible. Does that have consequences for these everyday practices? Does the impossibility of absolute truth mean that there are no truths at all? In some philosophical conceptions, general theories of truth are considered to be conditions for the validity of scientific and everyday truths. But that is not the case. It is an old mistake of philosophy to see its meta-reflections as foundations for those epistemic, moral, and social practices it reflects about. This mistake was also made by some postmodern theorists of culture, who relied e.g. on Heidegger ́s view of philosophy as a sort of “engine” of western culture. The consequence of this misunderstanding was that those parts of the humanities that subscribed to this understanding became irrelevant to the sciences and to politics, especially regarding their truth practices. The “hijacking” of the constructivist language about facts and truth by the political right is a manifestation of the politi- cal indeterminacy of some currents in the humanities that resulted from this irrelevance of the general theories of culture for concrete epistemic practices. 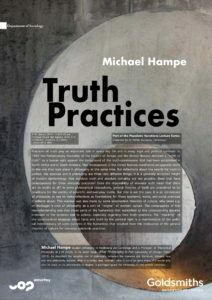 Michael Hampe studied philosophy in Heidelberg and Cambridge and is Professor of Theoretical Philosophy at ETH Zurich. In his latest book, What Philosophy Is For (University of Chicago Press, 2018), he described the possible role of philosophy between the sciences and literature, showing how and why philosophy became what it is today, and, crucially, what it could be once more, if it would only turn its back on its pretensions to dogma: a privileged space for reflecting on the human condition.